Neos again showed that is a company dedicated to a future vision, applied in the science of material for the ceramic tile sector. The Society of Ceramics and Glass Spain has announced under Cevisama 2015 the name of the winner of its prestigious Alfa Gold Awards, which recognize the most innovative products and processes. The jury, consisting of experts from the business and academic sectors linked to ceramic, has decided to award NEOS ADDITIVES by development of ceramic ceiling product with innovative proprieties as; low density, noise control, vapor permeable. The new product applies glazes and digital inks on ceiling ceramic supports. This development opens new possibilities for the ceramics application not limited only in the floor or wall but growing until the ceiling. 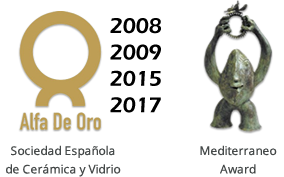 This is third award won by Neos, demonstrating the innovation vocational of our company and the constant collaboration with ceramic sector to grow the usage of ceramics and the volume of business. Our customers, Bestile and Azuliber, which in this particular case, provide us the invaluable help and cooperation in this project, which has always had Neos as part of their homes, where participation, development and completion of the project gave a collaboration that has been invaluable. NeoCeiling offer ceramic pieces to several construction areas and customized projects, for opening new fields of application, with high added value ceramics.